Tricholoma matsutake is an edible ectomycorrhizal mushroom (ECM) with high ecological and economic value. The mycorrhizal synthesis in vitro with T. matsutake isolates from Japan and Finland has been investigated in detail and widely reported. However, up to now there is no detailed description of morphological and anatomical characteristics of synthesized mycorrhizae in vitro with T. matsutake isolates from China under controlled laboratory conditions. In this study, using pure-culture ager plate systems, we demonstrated that a T. matsutake isolate from Southwestern China could form well-developed ectomycorrhiza with both exotic tree Pinus elliottii and indigenous tree Pinus armandii. The mycorrhizal association included fungal mantle sheaths and well-developed Hartig nets. P. elliottii is widely planted in the world, and it has important economic value in the timber and resin industries, whereas P. armandii is native to China and popularly planted in the central and southwestern China. Interestingly, the formation of mycorrhizae of P. elliottii was earlier and more abundant compared with P. armandii in the pureculture plate system. Our findings provide a new perspective to study the cultivation of T. matsutake in the world, and also to the propagation of the mycorrhizal P. elliottii and P. armandii seedlings in China. Tricholoma matsutake (S. Ito & S. Imai) Singer also known as song-rong or song-koumo in China, is a highly esteemed and commercially valuable ectomycorrhizal basidiomycete mushroom. The species is distributed throughout the Circumboreal northern hemisphere including countries in Asia (Japan, China, Bhutan, and Korea), Europe (Finland, France, Italy, Sweden, Norway, Germany, and Switzerland), and North American [1-3]. In China, suitable habitats for T. matsutake are mainly located in two main regions: Southwestern China, which includes Yunnan Province, Sichuan Province, the Tibet Autonomous Region, Guizhou Province, and northeastern China which includes Heilongjiang Province and Jilin Province [4,5]. Due to the excessive commercial collection and suitable habitats damage, the natural populations of T. matsutake have been significantly reduced or even extinct in main producing regions of China and Japan, etc . Therefore the conservation and management of natural population of T. matsutake have become urgent, and it has been listed as a category II national endangered species in China since 1999 . The principal host plant of T. matsutake is Japanese red pine (Pinus densiflora Sieb. & Zucc) in forests throughout Japan, Korea, and northeastern China [8,9]. In northern Europe, T. matsutake is primarily associated with scots pine Pinus sylvestis and Picea abies (L.) Karst . Other host trees include Abies veitchii and Tsuga diversifolia in subalpine forests of Japan , Pinus thunbergii, Pinus pumila, and Quercus mongolica in Northeastern China and Korean peninsula , Pinus yunnanensis, Pinus wallichiana, Pinus armandii, Castanopsis orthacantha, Quercus aquifolioides, Lithocarpus spp., and Pasania spp. in Southwestern China and Bhutan [13,14]. Besides these natural hosts, T. matsutake has been experimentally proven to associate with a birch species Betula platyphylla var. japonica and Andean Cedrela hererae (Meliaceae) in vitro [15-17]. The wide range of host plants in nature highlights the significance of searching for better host relationship of T. matsutake during in vitro mycorrhizal synthesis. T. matsutake isolate from Finnish formed mycorrhiza on native P. sylvestris and P. abies seedlings in vitro, but a Japanese isolate did not . Therefore, a comparative in vitro mycorrhizal synthesis experiment would be necessary, in which native or exotic combinations between plant species and T. matsutake isolates from diverse geographical locations. In the search for better host plants of a T. matsutake isolate YN1 from Southwestern China, we found that the exotic slash pine (Pinus elliottii Engelm) formed extensive mycorrhiza with T. matsutake YN1 clone. P. elliottii is native to the Southeastern United States and cultivated worldwide . Because of its remarkable characteristics, which include rapid growth, wide adaptability, and high resin content, it was introduced into China for afforestation in more than 12 provinces [19,20]. The finding of association of Chinese T. matsutake isolates with exotic pine tree P. elliottii was interesting. We then further evaluated the colonization level of P. elliottii by comparing it with the indigenous tree Pinus armandii, which has an extensive distribution in Central and Southwestern China . The aim of present study is to investigate the relationship between T. matsutake and these two conifer trees by in vitro mycorrhizal synthesis using a pure-culture ager plate system , and presents a comparative description of morphological and anatomical characteristics of these ectomycorrhizas. T. matsutake YN1 isolate was obtained from a piece of fruiting body, which was collected in Nanhua county, Yunnan province, China in 2014. The pure culture mycelia were maintained on modified Pachlewski medium containing yeast 1g of extract, 20g of glucose, 5 g of maltose, 0.5 g of ammonium tartrate, 1 g of KH2PO4, 0.5 g of MgSO4.7H2O, 0.1 g of thiamine-HCl and 1 mL of trace-element stock solution (1 L trace-element stock solution contained 8.45 g of H3BO3, 5 g of MnSO4.H2O, 6g of FeSO4.7H2O, 0.625 g of CuSO4.5H2O, 2.27 g of ZnSO4.7H2O and 0.27 g of (NH4)2MoO4) per liter. The pH was adjusted to 5.8 before autoclaving for 20 min at 121°C. Eight to ten small slivers of mycelium cut from T. matsutake mother cultures were transferred to sterile 250 mL glass flasks containing 100 mL liquid modified Pachlewski medium. After 1 to 2 month of stationary incubation in the dark at 23°C, the mycelium was used as inoculum for mycorrhiza synthesis. Seeds of P. elliottii and P. armandii were obtained from Forestry Bureau of Hubei Province, China, and conserved at 4 until utilization. For germination, they were treated in liquid nitrogen for 30 sec, then surface-sterilized with 30% H2O2 for 30 min, followed by washing several times with sterile distilled water. The seeds were left to germinate on sterile 1% water agar medium in petri dishes in the dark at 23°C for 6 days and in the light at 23°C for 3 days. Following germination, seedlings without microbial contamination were transplanted into growth/synthesis plates. Mycorrhizal syntheses were conducted in large plastic petri dishes (150 mm diameter). The plates were poured with a deep layer of half-strength MS medium (Murashige and Skoog 1962, SIGMA-ALDRICH, USA) without sucrose. A sterile cellophane membrane was placed on the surface of the MS medium to prevent the roots from growing into it. Young seedlings were picked up with sterile forceps and planted on the cellophane membrane in the middle of the plate. Plates were sealed with parafilm (Bemis company, Inc. USA), and the lower portion was wrapped in aluminum foil to prevent light affecting the developing root system and mycorrhizae. Sets of Plates were then maintained at an angle of approx. 75° in a growth chamber at a constant 23°C under a regime of 16 h light, 8 h dark. After 3-5 days of growth, liquid cultured mycelial inoculum was applied to the root system. Plates were then returned to the growth chamber. 2 cm shoot cuttings of Populus trichocarpa with internodes were used as control. Mycorrhizae were examined with the aid of a stereomicroscope (Olympus SZX16). For cross section, putative mycorrhizal root tips were removed from the seedlings, and 2-3 mm segments were cut and fixed in FAA fixative (10% (v/v) formaldehyde, 50% (v/v) absolute ethanol, 5% (v/v) acetic acid), and dehydrated through a graded ethanol series and embedded using paraffin (Sinopharm Chemical Reagent Co.,Ltd, China). Serial sections of 10 μm thickness were obtained by a microtome (Thermo Microm HM360) and attached to microscope slides. Sections were dewaxed in xylene, rehydrated through a graded ethanol series, and stained with 1% safranin O dissolved in 50% ethanol. This was followed by ethanol washing and subsequent staining of sections with 0.1% fast green in 80% acetone. The samples were viewed under a light microscope (Olympus BX51, Japan) and images taken using a MicroPublisher 5.0 RTV camera attached to the microscope. Genomic DNA from sporocarps, mycelium cultures and mycorrhizae tips was extracted with a hexadecyltrimethylammonium bromide (CTAB) protocol . The primer pair ITS1F/ITS4 (Gardes and Bruns 1993) was used to amplify the internal transcribed spacer (ITS) region of genomic ribosomal RNA gene (rDNA). The optimized polymerase chain reacon (PCR) conditions were as follows: 94°C for 4 min, followed by 35 cycles of 94°C for 30 sec, 56°C for 30 sec and 72°C for 60 sec, with a final step of 72°C for 5 min. Negative controls without DNA were included in all runs to detect possible contaminations. PCR products were sequenced by a commercial sequencing service (Quintarabio Co. Ltd, China) with the same primers used in amplification. Contigs representing consensus were assembled and BLAST searched against fungal sequences in GenBank. Original sequences of the present study were deposited in GenBank under accession numbers MF521936, MF521937, MF521898 and MF521899. The Nucleotide sequences of the ITS-rDNA region of T. matsutake YN1 isolate (GenBank acc. MF521898) from Southwestern China was consistent with that of its parent sporocarp (GenBank acc. MF521936). The ITS sequences of T. matsutake YN1 isolate was compared with the Japanese isolate AB968622 , the Finnish isolate GQ904716 , and another published ITS sequence GU134497 from Northeastern China . There were no variation among ITS regions (642 base pairs) of these isolates (Supplementary material Table 1), and thus the isolate YN1 was confirmed to be T. matsutake. Table 1: Comparison of the ITS Sequence of T. matsutake YN1 isolate with the corresponding sequences retrieved from Genbank database. Using the pure-culture plate system, colonization of T. matsutake on lateral root tips of P. elliottii was observed about 2 months after inoculation but was not evident on P. armandii on this time. The obvious mycorrhiza morphology began to see on lateral roots of P. armandii about 75 days after inoculation. All seedlings formed well-developed ectomycorrhizas with T. matsutake without microbial contamination 4 months after inoculation (Figure 1). No ectomycorrhiza were found on the roots of P. trichocarpa and the control seedlings without inoculation. The ITS sequences from the mycorrhizal root tip of P. elliottii (GenBank acc. MF521937) and P. armandii (GenBank acc. MF521899) showed 100% identity to the T. matsutake YN1 strain. Morphologically, the ectomycorrhiza of T. matsutake with P. elliottii (Figure 1a and 1b) did not show significant difference to P. armandii (Figure 1e and Figure 1f). However, the formation of ectomycorrhiza of P. elliottii was earlier and more abundant compared with P. armandii. Both P. elliottii and P. armandii seedlings inoculated with T. matsutake had many swollen and dichotomous lateral roots with white root tips partially covered with extraradical mycelium on the root axis (Figure 1b and Figure 1f). 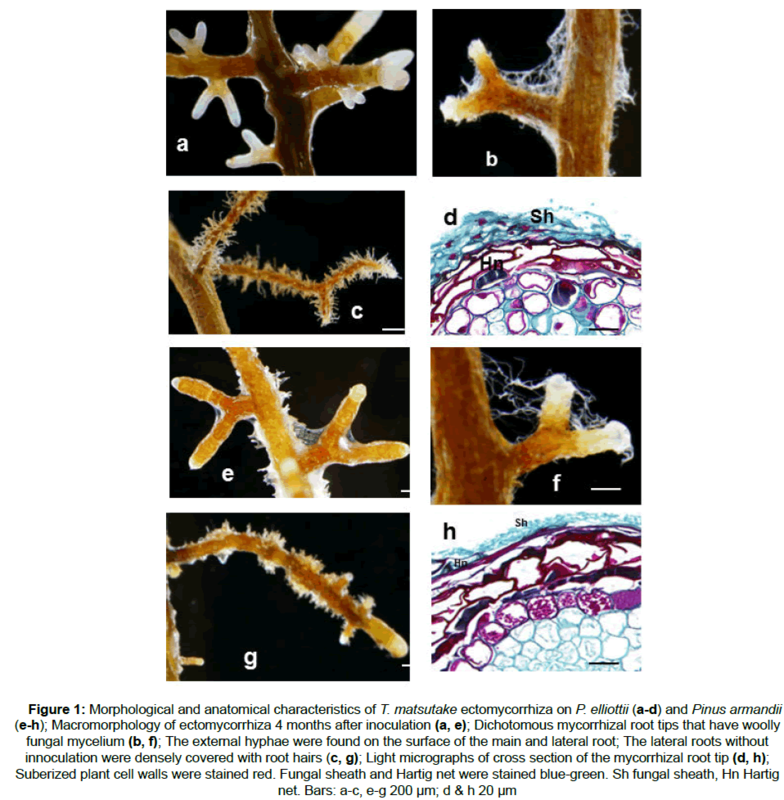 The carbonization of cortices in the basal mycorrhizal root, which is typical of T. matsutake mycorrhiza in the granite-based soil in vitro , was not observed. The anatomical characteristics of ectomycorrhiza of P. elliottii (Figure 1d) were very similar to those of P. armandii (Figure 1h). A continuously developed Hartig net at the lateral root was observed with slightly thick-walled fungal sheath. “Taming” T. matsutake for commercial cultivation has long been a dream due to its huge economic and ecological value. However, although many efforts have been made, almost all attempts have failed partly due to a lack of knowledge about its genetic characteristics and understanding of symbiotic molecular interaction with host plants. Within the framework of the JGI Mycorrhizal Genomics Initiative, the genomic information of T. matsutake is currently available (http://genome.jgi.doe.gov/Trima3/Trima3.home.html), which will speed up the studies on T. matsutake biology and light the way to artificial cultivation. Attempts to cultivate T. matsutake began in Japan at the start of the twentieth century . Although the great technical challenges, considerable progress has been made by Japanese researchers. Initial successes include germinating spores , obtaining pure culture mycelia, synthesizing ectomycorrhizas in vitro , and artificial shiro formation in an open-pot culture system containing granite-based soil substrate , while fail to produce fruit-body or establish plantations using artificially synthesized mycorrhizal seedlings. In China until now, there is still no formal report on T. matsutake mycorrhizal synthesis under axenic conditions in vitro. The main difficulty is that the isolation of pure-culture mycelia from fruit-body is relative difficult, and the growth of mycelium is very slow in vitro . Using the modified Pachlewski medium, the pure-culture mycelia were successfully obtained from the fruit-body tissue collected in a mix forest in southwestern China. Based on ITS sequences, we did not detect any variation between this isolate with another two isolates from Japan and Finland respectively. To overcome the slow growth rate of mycelia, liquid cultured mycelia were used as inoculum, which grow much better and easy to operate comparing with solid inoculum. The efficient mycorrhizal formation in vitro is largely dependent on the cultivation systems. For fast-growing plant nursery fungi, an open-pot cultivation system is an effective method for obtaining containerized ectomycorrhizal seedlings. In this system, several species even produce ectomycorrhizal mushroom in the greenhouse, including Cantharellus cibarius , Tricholoma portentosum, Tricholoma saponaceum and Tricholoma saponaceum . However, this routine method for establishing mycorrhiza is not applicable to T. matsutake. Using an aseptic test-tube system filled with agar slope and clay beads, a Finnish group successfully synthesized the mycorrhizal seedlings . Despite having obvious advantages, this system seems to be time-consuming, and the mycorrhiza structures are easy to be disrupted by handling. Here, we used a modified pure-culture agar plate system , which was easy-to-use and proved to be efficient to form mycorrhiza using Chinese T. matsutake isolate. Whether the colonized seedlings in plate can be acclimatized in open pots or in nurseries will be interesting to determine. Besides the cultivation systems, host specificity, which requires optimal combinations of host plant species and T. matsutake isolates , is another important factor that needs to be considered in mycorrhizal synthesis in vitro. It is reported that local tree species are more compatible with local T. matsutake . However, the results of this study clearly indicated that exotic tree P. elliottii seemed to be more infectious than the indigenous tree P. armandii by Chinese T. matsutake isolates, although the morphological and anatomical characteristics of mycorrhiza showed no significant difference (Figure 1). P. elliottii originated from the United States  and was probably introduced into China in the late 1940s , whereas P. armandii is a natural host of T. matsutake in Southwestern China . Both P. elliottii and P. armandii are economically important trees, and popularly planted in Central and Southwestern China. The finding of efficient mycorrhizal synthesis of exotic pine P. elliottii with Chinese T. matsutake isolate raised the question about origin and evolution of T. matsutake species in China. T. matsutake in Asia was derived from the migration of T. matsutake from North America through the Bering Strait . If this is the case, it will partly explain the association of P. elliottii with Chinese T. matsutake isolate . In conclusion, this is the first in detail report on the synthesized mycorrhiza of T. matsutake isolate from China, formed with two commercially important trees, P. elliottii and P. armandii . The finding will have a practical significance for potential T. matsutake cultivation in the future. This work was supported by the Fundamental Research Funds for the Central Universities (Grant No. 2662015PY058), and Huazhong Agricultural University Scientific & Technological Self-innovation Foundation (Program No. 2662014BQ016). M Phylogeography and evolution in matsutake and close allies inferred by analyses of ITS sequences and AFLPs. Mycologia. 2004;96:730-741. Heilmann-Clausen J, et al. Taxonomy of Tricholoma in northern Europe based on ITS sequence data and morphological characters. Persoonia - Molecular Phylogeny and Evolution of Fungi. 2017;38:38-57. Trudell SA, et al. North American matsutake: names clarified and a new species described. Mycologia. 2017;1-12. Guo Y, et al. Prediction of the potential geographic distribution of the ectomycorrhizal mushroom Tricholoma matsutake under multiple climate change scenarios. Sci Rep. 2017;7:46221. Zeng DF and Chen B. Genetic variability and bottleneck detection of four Tricholoma matsutake populations from northeastern and southwestern China. Environ Microbiol. 2015;17 2870-2881. Wang Y and Hall IR. Edible ectomycorrhizal mushrooms: challenges and achievements. Canadian Journal of Botany. 2004;82:1063-1073. Sha T, et al. Genetic diversity of Tricholoma matsutake in Yunnan Province. Chinese Sci Bull. 2007;52:1212-1216. Gill WM, et al. Matsutake – morphological evidence of ectomycorrhiza formation between Tricholoma matsutake and host roots in a pure Pinus densiflora forest stand. New Phytol. 2000;147:381-388. Yamada A, et al. Ectomycorrhiza formation of Tricholoma matsutake on Pinus densiflora. Mycoscience. 1999;40:193-198. Vaario LM, et al. Ectomycorrhization of Tricholoma matsutake and two major conifers in Finland-an assessment of in vitro mycorrhiza formation. Mycorrhiza. 2010;20:511-518. Endo N, et al. Ectomycorrhization of Tricholoma matsutake with Abies veitchii and Tsuga diversifolia in the subalpine forests of Japan. Mycoscience. 2015;56:402-412. Murata H, et al. Traceability of Asian Matsutake, specialty mushrooms produced by the ectomycorrhizal basidiomycete Tricholoma matsutake, on the basis of retroelement-based DNA markers. Appl Environ Microbiol. 2008;74:2023-2031. Wang Y, et al. Ectomycorrhizal fungi with edible fruiting bodies 1. Tricholoma Matsutake and Related Fungi. Econ Bot. 1997;51:311-327. Yamanaka K, et al. Species of host trees associated with Tricholoma matsutake and close allies in Asia. Mushroom Science & Biotechology. 2011;19:79-87. Murata H, et al. In vitro shiro formation between the ectomycorrhizal basidiomycete Tricholoma matsutake and Cedrela herrerae in the Mahogany family (Meliaceae). Mycoscience. 2014;55:275-279. Murata H, et al. Monokaryotic hyphae germinated from a single spore of the ectomycorrhizal basidiomycete Tricholoma matsutake. Mycoscience. 2015;56:287-292. Murata H, et al. Ectomycorrhizas in vitro between Tricholoma matsutake, a basidiomycete that associates with Pinaceae, and Betula platyphylla var. japonica, an early-successional birch species, in cool-temperate forests. Mycorrhiza. 2015;25:237-241. Gholz HL, et al. Nutrient Dynamics in Slash Pine Plantation Ecosystems. Ecology. 1985;66:647-659. Wen XS, et al. Biology of Hylobitelus xiaoi (Coleoptera : Curculionidae), a new pest of slash pine, Pinus elliottii. Journal of economic entomology. 2004;97:1958-1964. Yang Y and Li C. Photosynthesis and growth adaptation of Pterocarya stenoptera and Pinus elliottii seedlings to submergence and drought. Photosynthetica. 2016;54:120-129. Liu L, et al. Phylogeography of Pinus armandii and its relatives: heterogeneous contributions of geography and climate changes to the genetic differentiation and diversification of Chinese white pines. Plos One. 2014;9:e85920. Chilvers GA, et al. A paper-sandwich technique for rapid synthesis of ectomycorrhizas. New Phytol. 1986;103:397-402. Moller EM, et al. A simple and efficient protocol for isolation of high molecular weight DNA from filamentous fungi, fruit bodies, and infected plant tissues. Nucleic acids research. 1992;20:6115-6116. Ma DL, et al. Application of SRAP in the genetic diversity of Tricholoma matsutake in northeastern China. Afr J Biotechnol. 2010; 9:6244-6250. Yamada A, et al. Ectomycorrhizal symbiosis in vitro between Tricholoma matsutake and Pinus densiflora seedlings that resembles naturally occurring 'shiro'. Mycorrhiza. 2006;16:111-116. Yamada A, et al. Ectomycorrhiza formation of Tricholoma matsutake isolates on seedlings of Pinus densiflora in vitro. Mycoscience. 1999;40:455-463. Danell E and Camacho FJ. Successful cultivation of the golden chanterelle. Nature. 1997;385:303-303. Yamada A, et al. Sustainable fruit-body formation of edible mycorrhizal Tricholoma species for 3 years in open pot culture with pine seedling hosts. Mycoscience. 2007;48:104-108. Yamada A, et al. Tricholoma matsutake Y1 strain associated with Pinus densiflora shows a gradient of in vitro ectomycorrhizal specificity with Pinaceae and oak hosts. Mycoscience. 2014;55:27-34. Gardes M and Bruns TD. ITS primers with enhanced specificity for basidiomycetes--application to the identification of mycorrhizae and rusts. Mol Ecol. 1993;2:113-118. Murashige T and Skoog F. A revised medium for rapid growth and bioassays with tobacco tissue cultures. Physiol Plant. 1962;15:473-497.